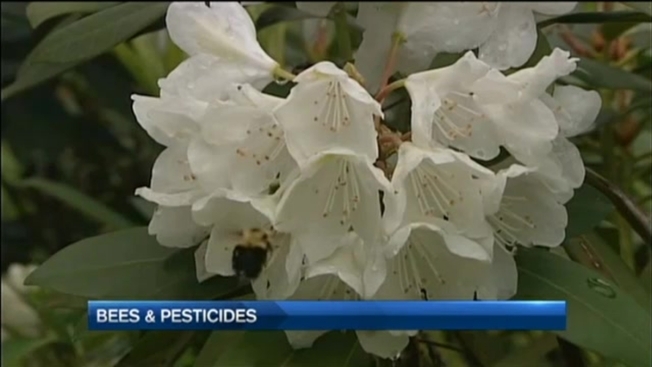 Chemicals to Blame in Bee Deaths? Certain pesticides used to treat many agricultural crops and garden plants may be potentially harmful to honeybees, according to research released this week by the federal Environmental Protection Agency. EPA officials announced a pesticide called imidacloprid, from a major class of insecticides called neonicotinoids, can harm honeybees through residue left in pollen or nectar in certain crops including cotton and citrus, but not on others like corn or berries. More preliminary risk assessment reports are still expected from the EPA, the agency announced. For years, bees have been dying in large numbers, which has worried many, because they pollinate an estimated third or more of the crops we eat or export. During an event about energy efficiency loans in Burlington, Vermont, necn asked U.S. Agriculture Secretary Tom Vilsack about the nation's honeybees. "It's something that even has the attention of the President, so it's serious business," Vilsack responded. "I wish there were a silver bullet, single answer to this." Vilsack explained bee deaths are a complicated, multi-pronged problem, not just due to pesticides. He noted environmental factors, stress due to transportation of pollinators, and habitat changes can all contribute to the problem. The USDA has directed researchers to investigate, Vilsack told necn, and is using conservation resources to foster healthy habitats on publicly-owned lands and forests. "People who live in urban areas don't think much of it," said Sen. Patrick Leahy, D-Vermont, who has long championed conservation issues regarding pollinators such as bats and bees. "If you're in an agricultural area, especially, you're killed if you don't have bees." Leahy said he will continue to push for the preservation of research dollars and other measures regarding pollinators in appropriations bills in the U.S. Senate. Deb Markowitz, Vermont's Natural Resources Secretary, pointed out the new EPA study is about science, not policy, so does not change regulations on pesticide use. "This is just the first of a series of reports," Markowitz said. "And I expect once those reports come through, we'll have a robust discussion on whether we should be changing regulation." Markowitz said she believes Vermont became the first state in the nation last year to add three varieties of bumblebees to the state's threatened and endangered species list. Those bees were the rusty-patched bumblebee, yellow-banded bumblebee, and Ashton cuckoo bumblebee. Vermont's bees have appeared to be in decline due to a parasite infestation, the state's Agency of Natural Resources said last year when the bees were added to the list of threatened and endangered species. The agency did note that other concerns for pollinator conservation exist from pesticides. The bumblebee listings did not bring restrictions against currently legal activities such as applying pesticides in accordance with state and federal regulations, Markowitz's office said. Markowitz called it critical to bring more attention to the tiny workers, because when the pollinators suffer, our entire food system could, too. According to the EPA news release, a 60-day public comment period will begin upon publication in the Federal Register. After the comment period ends, EPA may revise the pollinator assessment based on comments received and, if necessary, take action to reduce risks from the insecticide. In 2015, EPA proposed to prohibit the use of pesticides that are toxic to bees, including the neonicotinoids, when crops are in bloom and bees are under contract for pollination services, the news release said. The Agency temporarily halted the approval of new outdoor neonicotinoid pesticide uses until new bee data is submitted and pollinator risk assessments are complete.